For many space-faring nations, ambitions for Mars run broad and deep. Now, add China to the list of countries with Mars in their sights. News reports from China disclosed that country is considering a future Mars rover mission, with a potential 2020 launch date. Additionally came other hints that China may be looking to develop a next-generation heavy-lift launch system. This new project, while early in development, reveals how Chinese aspirations are growing rapidly. Human space flight successes have been followed by recent lunar mission successes of the Yutu lunar rover and the Chang’e-5 T1 test of a sample return mission. The Chinese Mars missions could influence future plans of ESA, India and NASA or more simply raise the urgency to execute missions in concept or early development without hesitation. The Mars rover mock-up display was presented at the aerospace show by China Aerospace Science and Technology Corporation (CASC). The design appears similar to the Yutu rover which landed successfully on the Moon late in 2013. While Yutu’s mobility system failed prematurely, many mission milestones were achieved. The Mars rover design is significantly larger than Yutu but includes changes that can be attributed to the challenges of roving Mars at tens of millions of kilometers distance and under more gravitational force. The wheels are beefed up, since it must withstand more force and rugged martian terrain (gravity on Mars is 37% of the Earth’s in strength but 2.25 times the strength of gravity on the Moon’s surface.) The the solar panels are larger due to 1.) less sunlight at Mars – 35% to 50% of Earth’s, and 2.) more electrically demanding instruments. The goals of the Chinese Mars rover will be to search for life and water. The NASA missions searching for indicators of habitable environments and for water has cost billions of dollars but the Chinese space program is operating on a fraction of what NASA’s annual budget is. Whereas the Chinese Mars program will be competing with the lunar program for government funds, it remains to be seen how quickly they can make progress and actually meet milestones for a 2020 launch date. Besides video of the China View reporter presenting and discussing the Mars rover (link to photo above), the video also includes a simulation of the Chinese lunar sample return spacecraft, which is underdevelopment and was tested early this month during a the Chang’e-5 T1 circum-lunar mission that proved a small re-entry vehicle. The actual dimensions of this rover were not reported but an estimate of the size can be determined by the size of the high-gain directional antenna. Assuming it is an X-Band dish, like the one on the MER Rovers and Curiosity, then this Sino-rover would be near the same size as the MER rovers – Spirit and Opportunity. The Sino-rover shares a six wheel design like MER and MSL rovers. Other reports from the China Daily indicated that industry leaders in China are urging China’s space agency to develop a more powerful heavy-lift launch system. It could be used for the nation’s human spaceflight goals to send a space station in to orbit, as well as send missions to Mars and beyond. “It is a must for us to develop a more powerful heavy-lift rocket if we want to reach and explore deep space,” Zhang Zhi, a senior rocket researcher at the China Academy of Launch Vehicle Technology the aerospace exhibition. Plans also call for an orbiter to likely function as a communication relay as MGS, Mars Odyssey and MRO have done for the American rovers. Whether this would involve a single spacecraft such as the NASA Vikings or dual crafts such as the present American rovers with supporting orbiters is unknown. Given the successful landing of the Yutu rover encapsuled in a soft-lander, one might expect the same for the Chinese Mars rover rather than an airbag landing used by MER. Either way, they will be challenged by the seven minutes of terror just like the American rovers. They will have to solve for themselves the entry, descent and landing of a rover. Only American-made rovers have successfully landed on Mars; all Russian attempts have ended in failure. The presentation also stated future plans for a sample-return mission by 2030. If the first Chineses Mars rover lands successfully in 2020, it will join up to four active rovers on the surface. Curiosity, ExoMars (ESA/NASA), Mars Rover 2020 and MER Opportunity. Six years seems like a long time but MER’s Oppy is a proven trooper having lasted over ten years. Curiosity, barring the unexpected, might last beyond 2020. ExoMars and NASA’s 2020 rover are still in development phases. Using ExoMars or 2020, NASA has plans to recover collected samples from rovers and return them to Earth in the 2020s and possibly as soon as 2022. Chinese Moon Robots Wake up! China’s history making moon robots – the Chang’e-3 lander and Yutu rover – have just awoken from the forced slumber of survival during their first, long frigid lunar night and have now resumed full operations – marking a major milestone in the mission. This landmark achievement offers a realistic prognosis that the best is yet to come for this new dynamic duo of robots dispatched from Earth! The stationary lander and six wheeled rover were autonomously revived from their dormant mode this weekend. Both were then placed back into full working science mode in response to commands issued by Chinese space engineers at the Beijing Aerospace Control Center (BACC), according to CCTV, China’s official government broadcast network. Yutu woke up first on Saturday, Jan. 11, at 5:09 a.m. Beijing local time. The Chang’e-3 lander was awoken on Sunday, Jan. 12, at 8:21 a.m. Beijing local time, according to a BACC statement. Both vehicles depend on their life giving solar panels to produce power in order to function and accomplish their scientific tasks. They went to sleep to conserve energy since there is no sunlight to generate power with the solar arrays during the lunar night. The simple fact that both spacecraft survived half a month through the extremely harsh lunar night time environment when temperatures plunged to below minus 180 degrees Celsius, or minus 292 degrees Fahrenheit, and then restarted intact, proves the resiliency and robustness of China’s space technology. 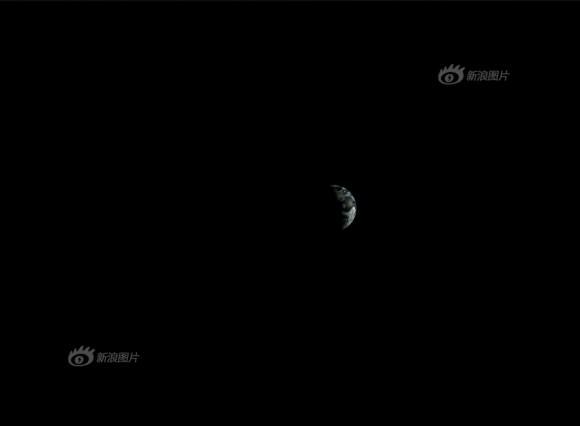 “During the lunar night, the lander and the rover were in a power-off condition and the communication with Earth was also cut off,” said Zhou Jianliang, chief engineer of the BACC, to CCTV. “When the night ends, they will be started up with the power provided by sunlight and resume operation and communication according to preset programs,” Zhou said. As night fell on the Earth’s Moon at Christmas time 2013, Yutu and the mother ship lander both entered a state of hibernation – determined to survive the utterly harsh lunar darkness upon the magnificently desolate gray plains. The mother ship began her nap first on Christmas Day, Dec. 25. Yutu went to sleep on Dec. 26 obeying commands sent by mission control at BACC, according to China’s State Administration of Science, Technology and Industry for National Defence (SASTIND). Just prior to hibernating, the lander snapped the first image of the Earth taken from the Moon’s surface in some four decades. See below. Now with the dawn of daylight the solar panels were unfurled and the instruments activated on both robots. Yutu has already resumed roving towards pristine, unexplored lunar terrain surrounding the touchdown zone at Mare Imbrium, nearby the Bay of Rainbows, or Sinus Iridum region. After driving in a semicircular path around the right side of the stationary lander, and snapping portraits of one another at 5 preselected locations, Yutu parked some 40 meters south of the mother ship – after touchdown and prior to the start of lunar night. 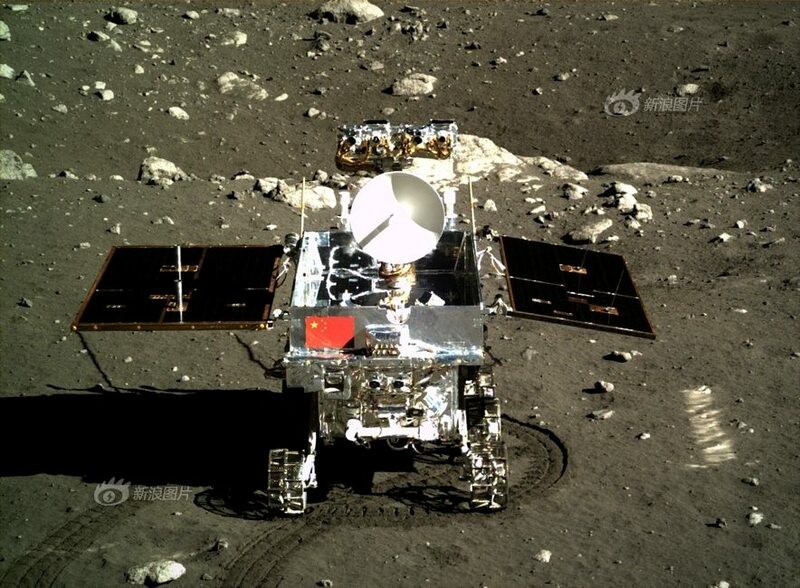 Yutu, which translates as ‘Jade Rabbit’, is departing the landing zone forever, trekking southwards for surface investigations expected to last at least 3 months – and perhaps longer depending on its robustness in the unforgiving space environment. The Chang’e-3 lander should survive at least a year. “They will begin to conduct scientific explorations of the geography and geomorphology of the landing spot and nearby areas, and materials like minerals and elements there,” noted Wu Weiren, chief designer of China Lunar Probe Program. ‘Jade Rabbit’ and the lander will use their suites of science instruments including cameras, telescopes, spectrometers and ground penetrating radar to survey the moon’s geological structure and composition to locate the moon’s natural resources for use by potential future Chinese astronauts. The robotic pair safely soft landed on the Moon on Dec. 14 at Mare Imbrium, located in the upper left portion of the moon as seen from Earth. Seven hour later on Dec. 15, Yutu rolled all 6 wheels onto the moon’s surface, leaving tracks behind as it cut into the loose regolith. Presumably they will continue exploring for about the next 14 days – the entire time span of their 2nd Lunar Day, unless they need to take a break from the high daylight temperatures. 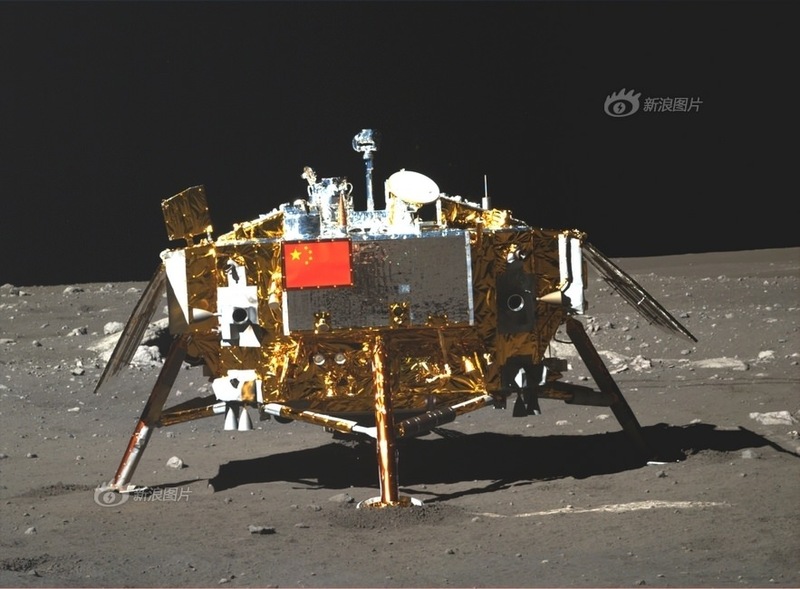 Thereafter Yutu and Chang’e-3 will function in alternating cycles of 2 weeks on and 2 weeks off for the duration of their independent working lifetimes. Not much on the Moon escapes the eyes of NASA’s Lunar Reconnaissance Orbiter, and China’s Chang’e-3 lander and Yutu rover are no exception! The pair touched down on the lunar surface on Dec. 14, and just over a week later on Dec. 25 LRO acquired the image above, showing the lander and the 120-kg (265-lb) “Jade Rabbit” rover at their location near the Moon’s Sinus Iridum region. The width of the narrow-angle camera image is 576 meters; north is up. 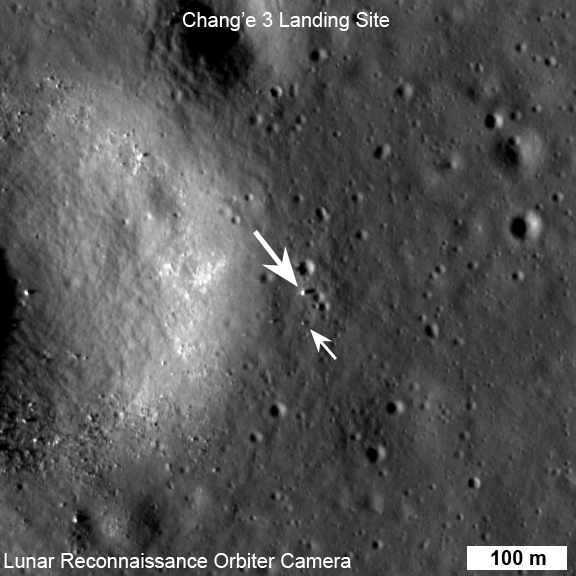 LRO was about 150 km (93 miles) from the Chang’e-3 site when the image was acquired. The rover is only about 150 cm wide, yet it shows up in the NAC images for two reasons: the solar panels are very effective at reflecting light so the rover shows up as two bright pixels, and the Sun is setting thus the rover casts a distinct shadow (as does the lander). Since the rover is close to the size of a pixel, how can we be sure we are seeing the rover and not a comparably sized boulder? Fortuitously, the NAC acquired a “before” image of the landing site, with nearly identical lighting, on 30 June 2013. By comparing the before and after landing site images, the LROC team confirmed the position of the lander and rover, and derived accurate map coordinates for the lander (44.1214°N, 340.4884°E, -2640 meters elevation). LRO circles the Moon in a polar orbit at an average altitude of 50 km (31 miles). The LROC instrument contains two narrow-angle camera heads (NACs) providing 0.5-meter/pixel panchromatic images over a 5-km swath, a wide-angle camera head (WAC) providing images at a scale of 100 meters in seven-color bands. 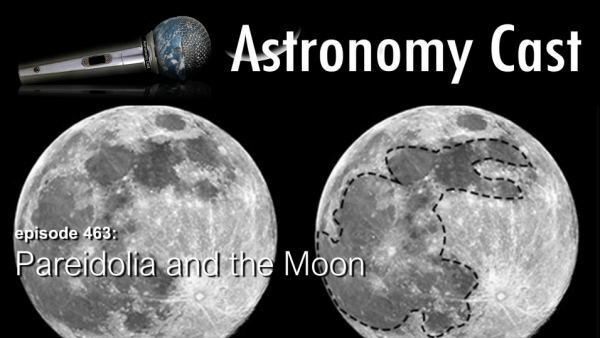 Read more on ASU’s LROC website, and check out Ken Kremer’s article featuring a video of Yutu’s rollout here.